Change it psychology helps you navigate difficult emotions and solve relationship problems. Change it psychology provides evidence based couple therapy, based on attachment and neuroscience research. Change it are Auckland psychologists who focus on change. We help you change habits, thinking, beliefs, and behaviour that is not serving you. We help you identify patterns that are causing problems in your life. Change begins with noticing patterns, understanding where they came from and how they were originally generally helpful. We then work towards new, more effective ways of being. We offer individual and couple sessions, a non-judgemental environment, a solution focussed approach, and a central Auckland location. Counselling is a broad term to describe many different forms of talking therapy. At Change it Psychology we specialize in increasing well being and confidence through proven scientific tools such as mindfulness, acceptance and commitment therapy (ACT), positive psychology, neuroscience and attachment research. If you are experiencing anxiety, stress, low mood, depression, low self esteem, eating issues, or problems in your relationships, our registered clinical psychologists will work with you to help you understand what could be causing and maintaining your difficulties and offer new ways of approaching these issues. Ultimately we know that people not only want help to get out of a hole but also to not fall in again! Change it psychologists use proven scientific methods. Insight, new skills and a deeper understanding of yourself and others will result as you continue thinking and practicing what we talk about. If you are experiencing stress or anxiety – including feeling worried, tense, on edge, a sense that you can’t let things go, feeling like thousands of thoughts are overwhelming you, wishing you had an “off” switch… we can help you gain a different perspective. If you are experiencing low mood or depression – including a sense that everything is too much, and you have lots of negative thoughts, you’ll be relieved to hear that depression is generally very treatable and we can help you. If you are experiencing concern about your weight or eating patterns – feeling like you sabotage yourself or struggle with emotional eating, we can help you break the habits that are holding you back. If you are concerned about your relationship, we can help you and your partner come to a new understanding of each other, and change entrenched patterns that are causing dissatisfaction. 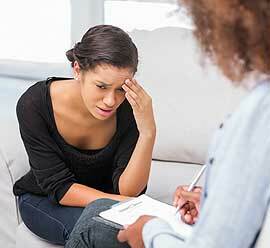 Change it psychologists will first ask you lots of questions about the issue that has brought you to therapy. They will help you set realistic goals to get you closer to your goal.